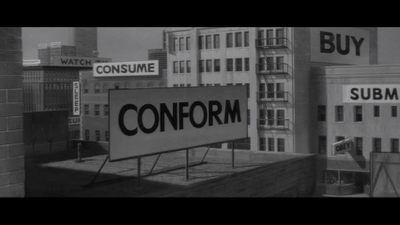 John Carpenter's They Live opens in a modern day (late 80s) and slightly more poverty-stricken representation of Los Angeles. Nada ("Rowdy" Roddy Piper) rides the rails from Colorado looking for work, and manages to land a construction job which allows him the opportunity to remove his shirt while making money. The job gives him enough cash to afford a reasonably sized shanty in the Hooverville down the street. He notices some suspicious activity in the church across the way, which coincides with recent hackings of local television stations. Unfortunately nobody seems very keen on a sweaty bearded man's face yelling at them, so this effort often falls upon deaf ears. Wake up from your living consumerist dreamscape and I'll give you that Super Soaker you always wanted. Nada notices something isn't right, and after a vicious raid on the church by the police, he recovers a box of sunglasses the church has manufactured, presumably because this was the 1980s and it seemed like the thing to do. Nada puts on the glasses one day to reveal a black and white horrorscape of repressive subliminal advertising and a world made up of disgusting aliens disguised as humans. These aliens often represent the upper crust of society: suited businessmen and austere ladies in hats and pearls. The homeless, plaid, and acid-washed Nada reacts appropriately at this discovery: by finding a shotgun and blowing away as many as he can. Roddy encapsulates all the great things about America (despite being Canadian). He comes across fellow "human" Holly Thompson (Masters of the Universe's Meg Foster), whose unworldly blue eyes bear a striking resemblance to that of a Siberian Husky. Since this is technically a movie featuring a wrester, Nada takes Holly hostage in order to escape the ramifications of his killing spree. 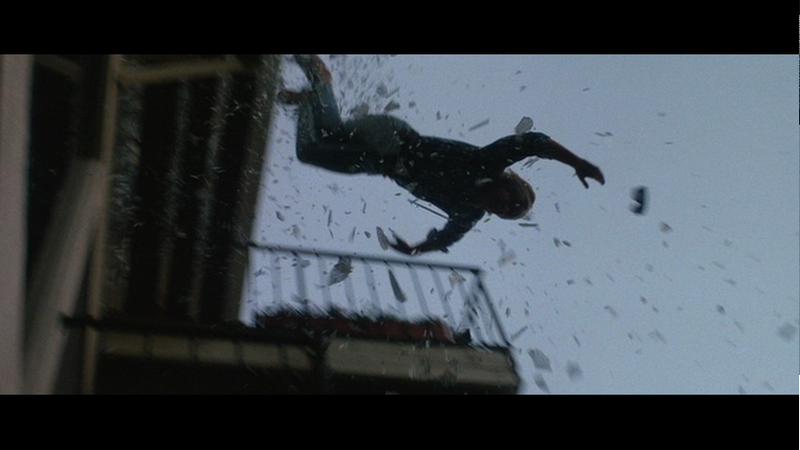 Holly plays along until the perfect moment, and then smashes a glass over his head and throws him seventy stories onto the rolling California landscape. Bruised but undeterred, Nada elicits the help of his construction friend Frank (Keith David) who for whatever reason has a violent resistance to wearing sunglasses. 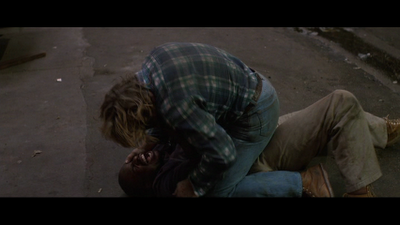 The two engage in a six minute fight scene in an alleyway. It proceeds with the awkward fits and starts of an actual street brawl; the actors pant and heave appropriately to fully express how exhausting such a fight would be. I assure you this fight scene continues for a very long time. "See the truth or I'll claw your eyes out!" Nada finally gets Frank on his side, and they proceed to a secret anti-alien terrorism meeting. It is broken up by the police and they use an alien transporter to zap to their space headquarters (or is it a television studio?). Either way, Nada destroys a fifty foot tall satellite dish with a Derringer pistol and saves the world from the eternal bliss of unbeknownst slavery. Though They Live is often marginalized into the category of sci-fi camp, it has a lot to say about consumerism, globalization, and the influence of media on society. It distills Communication Theory 101 into a simple plot device: those things we consume every day might have a negative impact on our consciousness. Carpenter displays this through simple and obvious commands such as "OBEY," "MARRY AND REPRODUCE," and "STAY ASLEEP." The conceit of the sunglasses is an efficient means of exposing Nada to this truth, and from then on the response is clear. 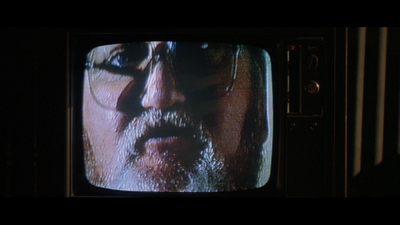 John Carpenter's Subtle Social Commentary. Though this is literally a black and white approach to a complex issue, Carpenter is under no obligation to explore the nuances of semiotics in his action/sci-fi movie. It is is a simple and straightforward introduction to these concepts, and has become a primer for how we think about media consumption. 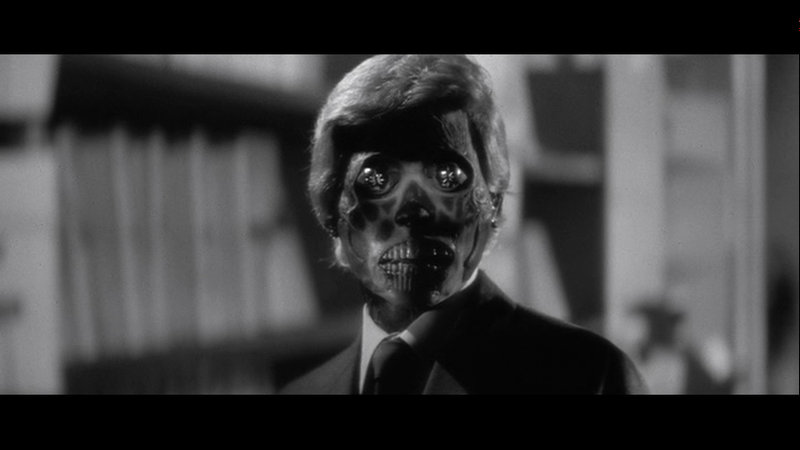 They Live was used as an example on the first day of class of my first ever college Communication course, and its use has a profound effect on future generations for its visual and thematic unambiguity. This is a prime example of the usefulness of popular culture in introducing concepts to a previously unenlightened audience. Camp, genre and b-movies can teach as well as entertain, and their approachability helps in their effectiveness. It may not be the end-all-be-all of media studies, but it is certainly an excellent starting point. One Communication Degree and One English Minor. Frank: The Golden Rule: He who has the gold makes the rules. Nada: You know, you look like your head fell in the cheese dip back in 1957. You see, I take these glasses off, she looks like a regular person, doesn't she? Put them back on... formaldehyde face! Actually, the Max Headroom incident is properly called "broadcast signal intrusion" and having it happen on TV is pretty rare. On radio however, the BBC FM transmitter network was jacked into two times in the mid-1970s to play two hours worth of banned records, while in the Soviet Union of the 1970s-80s it was common to have shortwave radio "intruded upon" after the broadcast day was over and used to transmit banned Western rock music. There is a reason "Nada" is attacking the aliens; beyond their mind manipulation, the things are using industrial pollution to make the atmosphere more like their planet. You should've mentioned that the guys behind "South Park" are fans of this movie, which is why they had an episode where the two crippled children, Timmy and Jimmy, fight each other and the fight is very similar to the Piper-David beatdown. I would have mentioned the South Park scene, but I couldn't find a decent clip of it on YouTube that didn't include speedmetal blasting throughout. I forgot about them polluting the planet, I thought the "polluting our brains" aspect was the primary message, with the perpetrator (and victim) of the aliens' reign to be media. And thanks for the info about the Max Headroom incident. People tend to misuse terms like "pirating" and "hacking" and I'm certainly not exempt. I mentioned it because it bore similarity to the actions of the organization in the film. There is a 10 minute YouTube documentary on the "Max Headroom incident" that makes a case that it was a political broadcast by somebody either employed by the station or a former employee. To me, TV/radio piracy is about actually running your own transmitter on an empty frequency and not hijacking somebody else's, unlike the Headroom incident or the "Ashtar Galactic Command" episode (1977) in the UK, where the sound transmission of a British TV station was intruded on to broadcast the 5 minute message of a space alien (!) to viewers in the Southeast of England. My wife will occasionally react to things that go on too long with, "Just put on the stupid glasses!" 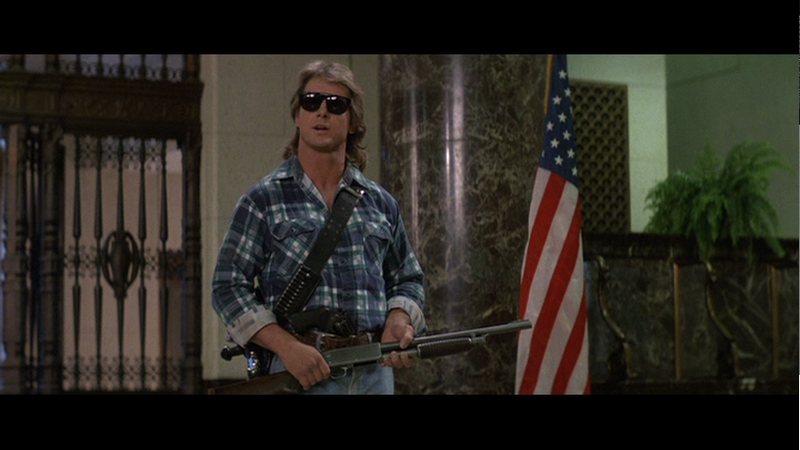 My high school girlfriend originally showed They Live to me and I didn't believe her when she said there was a 10 minute fight scene about sunglasses. How wrong I was.